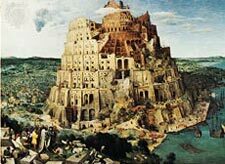 To reach the summit of the mountain of all knowledge, at what Pierre Teilhard de Chardin called the Omega point of evolution, its glorious culmination, it is necessary to demolish the Tower of Babel, which represents the fragmented and deluded world of learning today. By starting afresh at the very beginning in this way, all the divergent streams of evolution of the past fourteen billion years can converge in a megasynthesis of everything, much as Teilhard prophesied. However, this experiment in learning is not for the pusillanimous. It can only be undertaken if students are well prepared for what is going to happen to them. For passing through such a cataclysmic death and rebirth process involves the loss of everything that gives the individual a sense of security and identity in life. Gone are all dependencies on family, friends, job, career, and home. There can be no financial security when embarking on such an adventure. Neither can we fall back on religious beliefs, which give so many solace at times of crisis. A couple of metaphors can explain this process. First, digging up the seven pillars of unwisdom that provide the foundations for the Tower of Babel can only happen if a volcanic earthquake erupts in the depths of the Ocean of Consciousness causing a tsunami to rise to the surface, sweeping away all before it, rather like the way that a tsunami laid much of Aceh province on Sumatra to waste in December 2004. From a creative rather than a destructive perspective, such a life-changing death and rebirth experience is rather like a big bang erupting at the Origin of Life and hence the Universe. Indeed, it is only by returning to the Alpha point of evolution that we can reach the Omega point, building a coherent body of knowledge on the seven pillars of wisdom. In Hindu terms, Shiva the Destroyer has to act before Brahma the Creator can come into play, these Hindu gods, like all other such deities, being Divine energies as we experience them as human beings, not separate from us. In practical terms, the purpose of such an experiment in learning is to determine whether the global economy will self-destruct because artificial intelligence is possible or not. For if computers could one day exceed human intelligence, as some believe, then it is the economic imperative of our times that as machines become ever more powerful and cheaper compared to human labour, then unemployment would rise to unsustainable levels. On the other hand, if human beings are not machines and nothing but machines, then we need to make a radical change to the mechanistic work ethic so that humans can realize their fullest potential at the end of time. In this experiment in learning, practitioners thus conduct a thought experiment in which they imagine that they are a computer that switches itself off and on again, so that it has no programs within it, not even a bootstrap program to load the operating system. Starting from a tabula rasa, using only the energies within them, human beings, acting like a computer, then have the task of integrating all knowledge into a coherent whole. As individual consciousness expands to fill the Universe as the result of this experiment, we can then prove by the mathematical technique of reductio ad absurdum that human beings are not machines. Such a coherent body of knowledge also unifies the psychospiritual energies that primarily cause us human beings to behave as we do with the four forces recognized by the physicists: electromagnetic, gravitational, and the strong and weak nucleic forces. In this way, we can model the psychodynamics of the whole of society and thereby realize our fullest potential as human beings, free as much as possible of the collective, cultural, and personal mechanistic conditioning that leads to behave more like fearful human automata than the Divine, Cosmic beings we truly are.